SUMMIT COUNTY was erected from Portage, Medina and Stark, March 3, 1840. It derived its name from having the highest land on the line of the Ohio canal, originally called “the Portage Summit.” Along the Cuyahoga it is uneven and hilly; elsewhere level or undulating. It has immense beds of bituminous coal and fine clay. The soil is fertile and produces excellent fruit. The principal productions are wheat, corn, hay, oats, cheese, butter, potatoes and fruit. Area about 420 square miles. In 1887 the acres cultivated were 105,569; in pasture, 56,992; woodland, 23,513; lying waste, 4,343; produced in wheat, 552,269 bushels; rye, 1,121; buckwheat, 241; oats, 581,260; barley, 600; corn, 451,232; meadow hay, 26,082 tons; clover hay, 16,245; potatoes, 124,424 bushels; butter, 657,527 lbs. ; cheese, 1,011,957; maple syrup, 14,944 gallons; honey, 3,903 lbs. ; eggs, 345,814 dozen; grapes, 39,820 lbs. ; wine, 349 gallons; sweet potatoes, 200 bushels; apples, 75,006; peaches, 8,990; pears, 2,067; wool, 86,801 lbs. ; milch cows owned, 11,501. Ohio Mining Statistics, 1888.—Coal mined, 112,024 tons, employing 231 miners and 40 outside employees; fire clay, 3,000 tons. School census, 1888, 15,339; teachers, 379. Miles of railroad track, 154. Population of Summit in 1840, 22,469; 1860, 27,344; 1880, 43,788; of whom 29,198 were born in Ohio; 3,354, Pennsylvania; 1,644, New York; 182 Indiana; 124, Virginia; 42, Kentucky; 2,081, England and Wales; 2,275, German Empire; 1,321, Ireland; 499, British America; 207, Scotland; 200, France; and 109 Sweden and Norway. Census, 1890, 54,089. Summit county is the centre of a region that for a radius of about forty miles differs from any other in the State in the existence of a number of natural lakes, such as Silver, Congress, Myers, Springfield, Long, Summit, Turkey Foot, Chippewa, etc. The origin of these lakes was glacial, and they were formed during the same era that produced the varied natural formations peculiar to the region in the vicinity of Cuyahoga Falls. This region is one of great interest to geologists, and furnishes opportunity for study and research as to the forces producing the external formation of the State. Here, at one of the highest points of the State, the dividing ridge separates, with but a few miles between them, the Cuyahoga, flowing north to Lake Erie, and the Tuscarawas, whose waters, through the Muskingum, reach the Ohio river. During the occupation of the Indians the region had many important advantages for the red men. It could be reached from the lake in canoes, and by carrying their birch-bark canoes seven miles, navigation was clear to the Ohio river. Fish and game were plentiful. OLD PORTAGE, at the head of navigation on the Cuyahoga, became a trading-post for whites and Indians. It was a recognized landmark in the western boundary line of the United States, in the treaty of Fort McIntosh in 1798. In the war of 1812 it was the rendezvous of the troops furnished by the Western Reserve. The old Indian PORTAGE PATH was part of the ancient boundary between the Six Nations and the Western Indians. Its exact course is thus described with reference to present sites. It left the Cuyahoga at the village of Old Portage, about three miles north of Akron. It went up the hill westward about half a mile to the high ground, where it turned southerly and ran about parallel with the canal to near the Summit lake; there took the low ground nearly south to the Tuscarawas, which it struck a mile or two above the New Portage. The whole length of the path was, by the survey of Moses WARREN, in 1797, 8 miles, 4 chains and 55 links. The First Settlement made in this county was at Hudson, in the year 1800, by Mr. David HUDSON, the history of which we derive from a series of articles written by Rev. J. SEWARD, and published about the year 1835 in the Hudson Observer. In the division of the Western Reserve among the proprietors, the townships of Chester and Hudson fell to the lot of Birdsey NORTON and David HUDSON. and they arrived at Cleveland on the 8th of June. 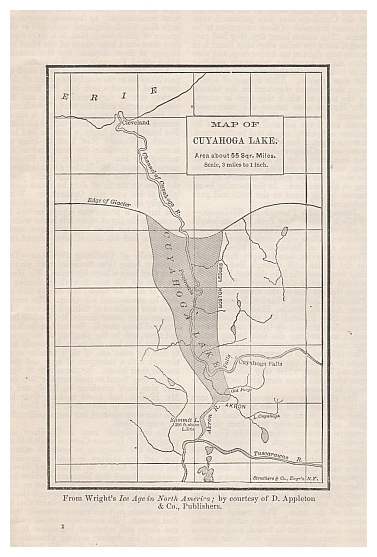 Locating a Township.—Morse’s Geography having given them about all the knowledge of the Cuyahoga that they possessed, they supposed it capable of sloop navigation to its forks. The season being dry, they had proceeded but a few miles when they found it in places only eight or ten inches deep, and were often obliged to get out, join hands, and drag their boats over the shallow places, and made but slow progress. After a lapse of several days, they judged they were in the latitude of the town of which they were in search. Mr. HUDSON went ashore and commenced hunting for a surveyor’s line much too far north, and it was not until after six days’ laborious and painful search that he discovered, towards night, a line which led to the southwest corner of his township. The succeeding day being very rainy he lodged under an oak tree, without any covering except the clothes he wore, with the grateful pleasure of resting on his own land. In the morning he returned highly elated to the boats and gave information of his success. Driving Cattle Through the Wilderness.—While in Ontario, New York, TAPPAN bought a yoke of oxen, and HUDSON two yoke and two cows. These eight cattle they committed in the care of MEACHAM, a hired man in TAPPAN’s service, who brought them safely on the Indian trail through Buffalo, until they found near the lake the west line of the seventh range on the Reserve. This line, it being the east line of the towns now named Painsville, Concord, Chardon, Monson, Newburg, Auburn, Mantua, Shalersville and Ravenna, they followed due south more than forty miles, crossing the Grand and Cuyahoga rivers, and striking the Salt Spring Indian trail near the southeastern corner of Ravenna. They followed this trail westwardly until they came to the new line recently made by HUDSON and TAPPAN, which they followed to the spot where the boats were lying on the Cuyahoga, in Boston. The difficulties encountered by these men in driving this small drove about three hundred miles on an obscure, crooked Indian path, and in following town lines through swamps, rivers and other obstacles fifty miles farther, almost through an uninhabited wilderness, were appalling; and what rendered their circumstances truly unpleasant, and in some cases hazardous, was that they were strangers to the country and without a guide. Their mode of travelling was to have several bags of flour and pork, together with two blankets and an axe, well secured on the backs of the oxen. They waded fordable streams and compelled their cattle to swim those that could not be forded, passing across those streams themselves with their provisions on rafts hastily made of sticks. Vicious Flies.—Mr. HUDSON’s company being thus collected, his first care, after making yokes for his oxen, was to open some road to his land. The gullies they crossed were numerous and frequent and often abrupt to an angle of forty-five degrees or more. On this road, bad as it was, they performed all their transportrtion in the year 1799, while their oxen were tormented and rendered almost unmanageable by immense swarms of large flies, which displayed such skill in the science of phlebotomy, that, in a short time, they drew out a large share of the blood belonging to these animals; the flies actually killed one of TAPPAN’s oxen this season. After having conveyed their small stock of provisions on the southwest corner of this town and erected a bark hut, Mr. HUDSON’s anxiety became very great lest he and his company should suffer for want of provisions, his stock being very much reduced in consequence of the Indians having robbed his boat. Not hearing from LACEY, a man he had left behind in Western New York to bring on stores, and dreading the consequences of waiting for him any longer, Mr. HUDSON started to meet him. Taking a boat at Cleveland, which was providentially going down the lake, on the 2d of July he found LACEY lying at his ease near Cattaraugus. With difficulty he there obtained some provisions, and having a prosperous voyage arrived in season, to the joy of those left in the wilderness, who must have been put upon short allowance had his arrival been delayed any longer. Difficulty of Obtaining Provisions.—The company being thus furnished with provisions, they built a large log-house. Mr. HUDSON also set his men to work in clearing a piece of land for wheat, and on the 25th of July he commenced surveying. The settlement now consisted of thirteen persons. In August every person except Mr. HUDSON had a turn of being unwell. Several had the fever and ague, and in the progress of surveying the town into lots, the party frequently had to wait for some one of their number to go through with a paroxysm of ague and then resume their labors. By the middle of September they found to their surprise they had only nine days’ provision o hand; and as Mr. HUDSON had heard nothing from his agent, NORTON, at Bloomfield, New York, he was once more alarmed lest they should suffer for want of food. distance in that direction. The next morning, on his return, he found that the boat had arrived with an ample supply of provisions. Harrowing Uncertainty.—Having taken an affecting farewell of his friends and acquaintances, whom he had left behind, Mr. HUDSON set out from Goshen in January, with his family and others. They tarried at Bloomfield, Ontario county, New York, until spring, making preparations for their voyage through the lakes and up the Cuyahoga. They purchased four boats, from one to two tons’ burden, and repaired thoroughly the wreck of HARMON’s boat. Lightly loading them with supplies to the value of about two thousand dollars, they completed every necessary preparation by the 29th of April. The crews of their boats consisted of Samuel BISHOP and his four sons, David, Reuben, Luman and Joseph, Joel GAYLORD, Heman OVIATT, Moses THOMPSON, Allen GAYLORD, Stephen PERKINS, Joseph and George DARROW, William M’KINLEY, and three men from Vermont by the names of DERRICK, WILLIAMS and SHEFFORD. The women in the company were the wives of Messrs. HUDSON, BISHOP and NOBLES, with Miss Ruth GAYLORD and Miss Ruth BISHOP. The six children of Mr. HUDSON completed the number. They had little trouble until they reached the mouth of the Cuyahoga. The wind on that day being rather high, Mr. HUDSON, in attempting to enter the river with his boat, missed the channel and struck on a sandbar. In this very perilous situation the boat shipped several barrels of water, and himself and all his family must have been drowned had not a mountain wave struck the boat with such violence as to float it over the bar. When up the river, within about two miles of their landing-place, they stopped for the night a little north of Northfield, at a locality now known as The Pinery. Waiting for the Fall of the Waters.—A tremendous rain in the night so raised the river by daybreak that it overflowed the bank whereon they slept, and even their beds were on the point of floating. Everything was completely drenched, and they were compelled to wait five days ere the subsiding waters would allow them to force their boats against the current. On the sixth day, May 28th, they reached their landing-place, from whence Mr. HUDSON, leaving his wife and children, hurried to see the people whom he had left overwinter and whom he found well. About the time they completed their landing, Elijah NOBLE arrived with the cattle and Mr. HUDSON’s horse, which had been driven from Ontario by nearly the same route that the cattle were the preceding year. Mr. David HUDSON died March 17, 1836, aged 75 years, leaving a memory revered, and an example of usefulness well worthy of imitation. two Congregational, one Episcopal and one Methodist church, four stores, one newspaper printing-office, two female seminaries, and about 600 inhabitants. The village is handsomely situated and neatly built, and the tone of society elevated, which arises in a great measure from its being the seat of the Western Reserve College. The college buildings are of brick, and situated upon a beautiful and spacious green, in an order similar to the edifices of Yale, on which institution this is also modelled, and of which several of its professors are graduates. The annexed view was taken near the observatory, a small structure shown on the extreme right. The other buildings are, commencing with that nearest—south college, middle college, chapel, divinity hall, president’s house, athenæum, and a residence of one of the professors, near the roadside, nearly in front of the athenæum. The Medical College at Cleveland is connected with this institution. By the catalogue of 1846-7, the whole number of professors and instructors in the college was 19; the whole number of students 320, viz., 14 in the theological department; 216 in the medical department; 71 undergraduates and 19 preparatory.—Old Edition. 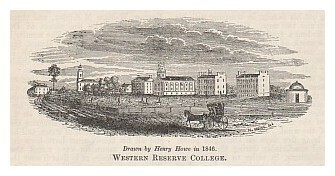 The old college buildings are now occupied by the WESTERN RESERVE ACADEMY, which is for the education of both sexes. It was established in 1882 under the charter of the old college, which now comprises “Adelbert College” and “College for Women,” at Cleveland. It is maintained by and is under the direction of the trustees of Adelbert College, and has an annual income of $3,000. The academy is under the charge of Prof. Newton B. HOBART. The site is beautiful, comprising about thirty acres of land. It began with a higher standard than that of any other preparatory school in the State and its reputation is of the highest. In the eight years of its existence it has had about 400 students from fifteen different States, of whom 111 have graduated and 79 entered varied colleges, as Yale, Harvard, Princeton, Cornell, Amherst, Adelbert, Cleveland College for Women, Ann Arbor, etc. HUDSON is twelve miles north of Akron and twenty-six southeast of Cleveland, on the junction of the C. & P. and C. A. & C. Railroads. City Officers, 1888: H. B. FOSTER, Mayor; E. E. ROGERS, Clerk; S. MILLER, Treasurer; L. E. REED, Marshal. Newspaper: Express, Independent, D. B. SHERWOOD & Son, editors and publishers. Churches: 1 Congregational, 1 Catholic, 1 Episcopal, 1 Methodist. School census, 1888, 263. C. F. SEESE, superintendent of schools. Her father, David HUDSON, the founder of the town, was a direct descendant of Hendrick HUDSON, who discovered the Hudson river in 1609. Hendrick named his youngest son David, and he was the sixth David in that line. He was born at Branford, Connecticut, July 17, 1760. His daughter, Anna, was the first while child born in Summit county. This event took place in a hut of a single room, which stood at what is now the junction of Baldwin with Main street. 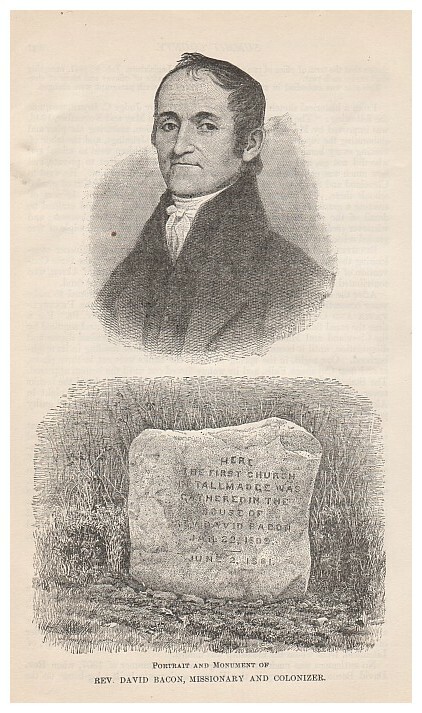 First Things, wheeled, arrived in March, 1802; log school-house, 1802; first burial in old cemetery, mother of John BROWN, 1808; Congregational Church formed September 4, 1802, David BACON, pastor, 1804 to 1807; first tannery opened by Owen BROWN, father of John, 1805; college opened, 1826; removed to Cleveland 1882, and Western Reserve Academy organized; town celebrations, June 18, 1850 and 1856, and October 28, 1890. At this celebration the president was Geo. L. STARR; the historical address by S. A. LANE, of Akron, the county historian; and another, “First ninety years of the century,” by Hon. J. C. LEE, Toledo. 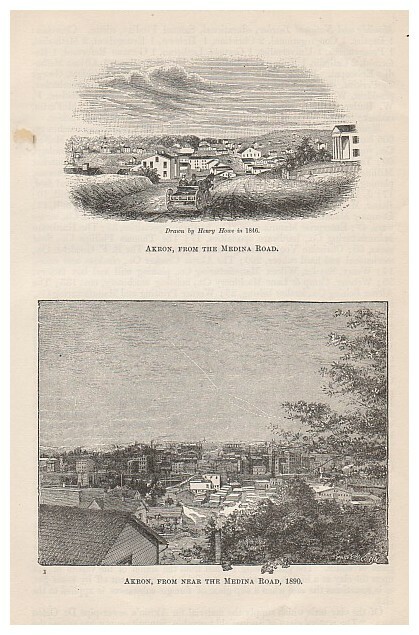 Akron in 1846.—The large and flourishing town of Akron, the county-seat, is on the Portage summit of the Ohio canal, at the junction of the Pennsylvania canal, 36 miles from Cleveland and 110 northeast of Columbus. The name of this town is derived from a Greek word signifying an elevation. Akron was laid out in 1825, where south Akron now is. In the fall of the same year, the Irish laborers on the Ohio canal put up about 100 cabins. South Akron grew rapidly for a few years; but in 1832 some buildings were put up half a mile farther north, and business in a short time centered here. In 1827 the Ohio canal was finished from Cleveland to this place. In 1841 Akron was made the county-seat of the new county of Summit. The same year the canal connecting Akron with Beaver, Pa., was opened, and a new impetus given to the town by these advantages. Akron contains 1 Episcopal, 1 Congregational, 1 Baptist, 1 Methodist, 1 Disciples, 1 Universalist, 1 German Lutheran, and 1 Catholic church, 20 mercantile stores, 10 grocery, 4 drug and 2 book stores, 4 woollen factories, 2 blast and 3 small furnaces, 1 carding machine manufactory, 5 flouring mills, 1 insurance company, 1 bank, 2 newspaper printing-offices, and a great variety of mechanical establishments. The mercantile business of this town is heavy and constantly increasing, and immense quantities of wheat are purchased. The water privileges here are good, and manufacturing will eventually be extensively carried on. In 1827 its population was about 600; in 1840 it was 1,664, since which it is estimated to have doubled. Two miles south of Akron is Summit lake, a beautiful sheet of water on the summit of the Ohio canal. Part of its waters find their way to the St. Lawrence, and part to the Gulf of Mexico.—Old Edition. A resident of Akron has given us some facts respecting the settlement of the country, and one or two anecdotes, which we annex. and went out and saw a large Indian with two rifles in his hand, and a deer quartered and hung across his horse. SPICER inquired what he wanted. The Indian replied in his own dialect, when the other told him he must speak English, or he would unhorse him. He finally gave them to understand that he wished to stay over night, a request that was reluctantly granted. His rifles were placed in a corner, his venison hung up, and his horse put into a large pig-stye, the only stable attached to the premises. The Indian cut out a piece of venison for Mrs. SPICER to cook for him, which she did in the usual way, with a liberal quantity of pepper and salt. He drew up to the table and eat but a mouthful or two. The family being ready to retire, he placed his scalping-knife and tomakawk in the corner with his rifles, and stretched himself upon the hearth before the fire. When he supposed the family were asleep, he raised himself slowly from his reclining position and sat upright on the hearth, looking stealthily over his shoulder to see if all was still. He then got upon his feet and stepped lightly across the floor to his implements of death. At this juncture the feelings of SPICER and his wife may be well imagined, for they were only feigning sleep and were intently watching. The Indian again stood for a moment, to see if he had awakened any one, then slowly drew from its scabbard the glittering scalping-knife. At this moment SPICER was about putting his hand upon his rifle, which stood by his bed, to shoot the Indian, but concluded to wait further demonstration, which was an entirely different one from what he had anticipated, for the Indian took hold and cut a piece of his venison, weighing about two pounds, and laying it on the live coals until it was warmed through, devoured it and went to sleep. Mrs. SPICER’s cooking had not pleased him, being seasoned too high. The day before he and his father lost themselves in the woods, and after covering his parent, under a log, with his blanket, he had wandered until he saw SPICER’s light. James BROWN, or, as he was commonly called, “Jim BROWN,” was one of the early settlers in the north part of the county. He was known throughout the country as the head of a notorious band of counterfeiters. Few men have pursued the business so long without being convicted. Aside from this he was to a certain extent respected, for he had the externals of a gentleman in his conversation and address, and had many friends. He was a fine-looking man, over six feet in height, with a keen penetrating eye. He even held the office of justice of the peace when last arrested. He had often been tried before, and as often escaped. Once he was sentenced to the penitentiary from Medina, and the sheriff had nearly reached Columbus, when he was overtaken with a writ of error and set at liberty. It is said that large numbers of young men have been drawn into his schemes from time to time, and thereby found their way to the penitentiary. Many anecdotes are related of him. AKRON, county-seat of Summit, about one hundred and ten miles northeast of Columbus, about thirty miles south of Cleveland, is an important manufacturing city, sewer pipe and stoneware being noted interests. It is the seat of BUCHTEL COLLEGE. Its railroads are: N. Y., P. & O.; C. A. & C.; Valley; and P. & W. It is also on the Ohio canal. Drawn by Henry Howe in 1846. AKRON, FROM NEAR THE MEDINA ROAD, 1890. Monthly and National Teacher, educational, Samuel FINDLAY, editor. Churches: 1 Baptist, 1 Congregational, 2 Christian, 1 Hebrew, 1 Evangelical, 2 Methodist, 1 Presbyterian, 1 Universalist, 1 German Lutheran, 1 German Reformed, 1 Reformed, 2 Catholic, 1 Episcopal, 1 Lutheran, 1 United Brethren, 1 African Methodist Episcopal. Banks: Bank of Akron, George W. CROUSE, president, George T. PERKINS, cashier; Citizens’ Savings and Loan Association, E. STEINBACHER, president, W. B. RAYMOND, cashier; City National, J. B. WOODS, president, F. W. BUTLER, cashier; First National, T. W. CORNELL, president, W. McFARLIN, cashier; Second National, George D. BATES, president, A. N. SANFORD, cashier. Manufactures and Employees.—AULTMAN, MILLER & Co., harvesting machinery, 605 hands; J. F. SEIBERLING & Co., harvesting machinery, 256; The J. C. MCNEIL Co., steam boilers, etc., 32; Akron Twine and Cordage Co., twine an cordage, 60; TAPLIN, RICE & Co., stoves and general machine work, 16; F. SCHUMACHER Milling Co., flour, etc., 276; Citizens’ Electric Light Co., 6; D. W. THOMAS, planing mill, 24; The Hower Co., oat products, 20; ALLEN & Co., flour and feed, 17; J. Park ALEXANDER, fire-brick, 20; W. B. DOYLE & Co., planing mill, 10; BAKER, McMILLEN & Co., wood-turning, etc., 98; A. A. BARTLETT, planing mil, 13; DEMPSEY Machine Co., general machine work, 12; D. E. H. MERRILL & Co., stone-ware, 49; Enterprise Manufacturing Co., hardware specialties, 35; The Hardware Manufacturing Co., hardware specialties, 17; The Thomas PHILLIPS Co., flour sacks, 50; Christian VOGHT, carriages and wagons, 10; The B. F. GOODRICH Co., mechanical and hard rubber, 260; The Akron Cracker Co., crackers and cakes, 14; WEARY, SNYDER, WILCOX Manufacturing Co., planing mill and box factory, 25; WEBSTER, CAMP & LANE Machinery Co., hoisting machinery, etc., 135; The Akron Belting Co., leather belting, 25; WERNER Printing and Manufacturing Co., lithographing, printing, etc., 140; The Beacon Publishing Co., printing and book-binding, 36; Akron Contracting and Cabinet Co., builders’ supplies, etc., 25; SMITH Brothers, druggists’ supplies, etc., 24; The Akron Iron Co., bar iron, etc., 412; C. A. HANKEY, planing mill, 15; The Diamond Match Co., matches, 664; WHITMAN and BARNS Manufacturing Co., knives and sickles, 286; MILLER Match and Chain Co., matches and chains, 138; J. C. EWART & Co., roofing tile, etc., 70; The SELLE Gear Co., spring wagons and truck gears, 46; The Buckeye Sewer-pipe Co., sewer-pipe, 40; The HILL Sewer-pipe Co., sewer-pipe, 45; WHITMORE, ROBINSON & Co., stoneware, etc., 129; The SEIBERLING Milling Co., flour and feed, 23; The Akron Fire-brick Co., fire-brick, 8; T. C. BUDD, machine and foundry work, 7; Akron Steam Forge Co., iron and steel forging, 23; F. HORIX, lager beer, 12; ROBINSON Brothers & Co., sewer-pipe, 70; WEEKS Brothers, stoneware, 31; VIALL & MARKELL, stoneware, 25; COOK, FAIRBANKS & Co., stoneware, 23; Akron Stoneware Co., stoneware, 43; F. W. ROCKWELL & Co., stoneware, 20; The Ohio Stoneware Co., stoneware, 32.—State Report, 1888. Population in 1880, 16,512. School census, 1888, 7,707; Elias FRANNFELTER, school superintendent. Capital invested in industrial establishments, $7,202,000. Value of annual product, $7,487,369.—Ohio Labor Statistics, 1887. Akron’s Sewer-pipe Industry is famed throughout the whole country. The sewer-pipe has been in use in many cities for years and only gains added reputation by the test of time. It is manufactured in large quantities by skilled labor and powerful machinery. It is thoroughly vitrified and impervious to acids, gases or steam. The glaze being formed from the action of the vapors of salt upon the clay at a high temperature is not liable to scale or cut off by sewer gas, as is sometimes the case when a slip glaze of foreign substances is applied to the clay. to ten feet thick, overlain by shales and a hard sand-rock, and underlain by shales and occasionally by an inch or two of coal. The clays are of several grades of excellence; the poorest, or ‘chuck’ clay, which is commonly rejected, is found on the top of the bed. The beds are found close to the surface in the largest part of the territory. They are mined by long pits or trenches by which the whole area worked is taken clean and the refuse is piled back. In one or two instances the clays are mined by drifting, which gives a much cleaner product than the customary way. The district in which these clays are found is small, all the workings being at one place, viz., North Springfield, Summit county, where there are twelve or fifteen banks. They supply all the Mogadore, Tallmadge, Cuyahoga Falls and Akron stoneware potteries, which make at least twice as much stoneware as any other district in Ohio." Akron has another industry—the MATCH INDUSTRY—which is almost as widely known as its famous sewer-pipe. One-fifth of the entire match product of the United States is made by one concern in Akron. The BARBER Match Company was established in 1847 by George BARBER, and became by consolidation a branch of the Diamond Match Company in 1881. 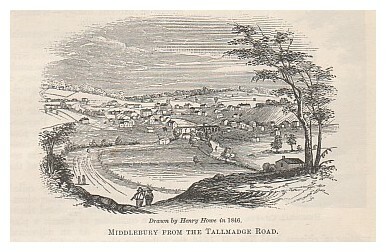 MIDDLEBURY FROM THE TALLMADGE ROAD. The Akron branch of this concern use annually in the manufacture of matches 3,000,000 feet of white pine lumber, 70 tons of brimstone, 17,000 lbs. of phosphorus, 33,6000 lbs. chlorate of potash, 30,000 lbs. of glue and 50,000 lbs. of parafine wax. The work is largely done by improved machinery. On the location of the canal at Akron the town of Middlebury began to lose its prestige, and its citizens decided that it must get increased water-power to hold its own against the young rival. The MIDDLEBURY HYDRAULIC COMPANY was organized and authorized by the Legislature “to raise the natural surface of Springfield lake, in which the Little Cuyahoga had its rise, six feet, and lower it four feet below the natural surface. This gave to the water-power of the village a permanency and sufficiency that could be relied on at all times.” In 1872 Middlebury was annexed to Akron as the sixth ward of that city. MIDDLEBURY is now a part of Akron. In our old edition it was thus described as in the township of Tallmadge: “Two miles east of Akron and on both sides of the Little Cuyahoga is the village of Middlebury. As early as 1807 a grist mill was built on the site of the town by Amos NORTON and Joseph HART. The town was laid out in 1818 by them, and soon became the most thriving village in this whole region until the canal was cut through to Cleveland, when Akron took away most of its trade. It has two churches and about 1,000 people.”—Old Edition. Within Akron’s beautiful and well-kept Glendale cemetery stands the AKRON SOLDIERS’ MEMORIAL CHAPEL, dedicated Decoration Day, 1876. At the time of its erection it was the only building of the kind in the country. Its erection is due to the BUCKLEY Post of the G. A. R., aided by outside subscriptions. The chapel is a handsome stone structure, its cost $25,000. Built into its interior walls are fourteen marble slabs, engraved with the names of the fallen brave of Akron and Portage township. Col. Lewis P. BUCKLEY, from whom the Post is named; a second, representing woman’s work in the war; and the third, commemorative of three epochs in national history—Washington, Perry and Lincoln. There are also eight small memorial windows, individual contributions. The admirable AKRON SCHOOL SYSTEM (Vol. I., page 143) is the result of the efforts of Rev. 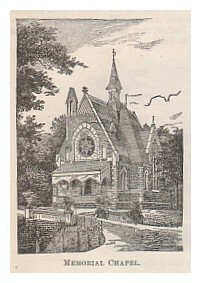 I. JENNINGS, a young man, pastor of the Congregational church at Akron, who, in 1846, set himself to work to recognize the common schools of Akron. Previous to this the schools of Akron were poor affairs, giving only the most rudimentary education, and even that was accorded to only about two-thirds of the children of school age. 1. Let the whole village be incorporated into one school district. 2. Let there be established six primary schools in different parts of the village, so as best to accommodate the whole. 3. Let there be one grammar-school, centrally located, where instructions may be given in the various studies and parts of studies not provided for in the primary schools, and yet requisite to a respectable English education. 4. Let there be gratuitous admission to each school in the system for the children of residents, with the following restrictions, viz. : No pupil shall be admitted to the grammar school who fails to sustain a thorough examination in the studies of the primary school, and the teacher shall have power, with the advice and direction of the superintendent, to exclude for misconduct in extreme cases, and to classify the pupils as the best good of the schools may seem to require. 5. The expense of establishing and sustaining this system of schools shall be thus provided for: First, by appropriating what public school money the inhabitants of the village are entitled to, and what other funds or property may be at the disposal of the board for this purpose; and secondly, a tax be levied by the Common Council upon the taxable property of this village for the balance. chosen that the term of office of two of them shall expire each year. This plan was embodied in an act passed by the Legislature, Feb. 8, 1847, excepting that the name of officers and mode of election of the sixth paragraph were changed. BUCHTEL COLLEGE stands on a beautiful and commanding eminence over-looking the city. It was founded in 1870 through the action of the State Convention of Universalists, and named in honor of John R. BUCHTEL, of Akron, who contributed $25,000 for the building and $6,000 for the endowment fund. After the completion of the Ohio and Erie Canal, it was determined to make water connection between Cleveland and Pittsburg, and in 1841 the PENNSYLVANIA AND OHIO CANAL was completed from Akron to Beaver, Pa. For a time the canal flourished, but the competition of and later the control acquired by the Cleveland and Mahoning Railroad Company, led to its gradual disuse and dilapidation, until it became a menace to the health of those residing in its neighborhood. One night, in the spring of 1868, the banks were cut in three places, at and near Cuyahoga Falls, and its waters flowed out until the bottom appeared. The State threatened prosecution, but none was ever commenced and the breaks never repaired. Again, in the spring of 1874, the canal was cut by night in Akron by disguised men, but no one was punished, although the supposed guilty parties were arrested. In 1838 a party of capitalists, largely Eastern men, undertook to build a great manufacturing city at a point between Cuyahoga Falls and Akron, to be called SUMMIT CITY. A joint stock company, with a capital of $500,000, was organized. The city was to be supplied with inexhaustible water-power, by means of a dam and canal diverting the waters of the Cuyahoga river. Work was begun and in 1839 water turned into the canal, but at this point the money gave out, and matters were at a standstill until in 1843 Horace GREELEY, while on a visit to Akron, was so impressed by the scheme that, on his return to New York, he published in the Tribune an enthusiastic article, predicting that “Summit City” would become the “Lowell of the West.” Nevertheless, no more money could be raised for the future “Lowell,” and it “died a’bornin’.” The lands of the company, called the “Chuckery,” are now in the suburbs of Akron. The history of the settlement of the township of Tallmadge is peculiar. At a drawing among the members of the Connecticut Land Company, at Hartford, Connecticut, Jan. 30, 1798, this township was drawn by the “Brace Company” and others. In 1803 the proprietors made a division. The Brace Company took all west of the meridian, one-half mile west of the centre line. The remainder of the township was taken by Ephraim STARR and Col. Benjamin TALLMADGE, of Litchfield, from whom the township was named. REV. DAVID BACON, MISIONARY AND COLONIZER. south line of the township, half a mile west of the centre, and moved in with his family, the only one in the township. Mr. BACON had conceived the idea of a religious colony, and made a contract with the owners for nearly the entire township; in all about 12,000 acres at $1.50 per acre. Payments were to be made upon time, but when payments were made for any part in full a deed was to be given. In the preceding year he had a new survey made of the township upon his own plan. He divided it into sixteen squares of 1,000 acres each, called Great Lots, a mile and a quarter on each side. A road or highway was established sixty-six feet wide on each line of the Great Lots, except the exterior or township line. These roads all run north and south or east and west. A public square of seven and a half acres was laid out as a common centre for churches, schools, stores, etc. 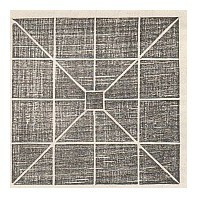 From this square roads ran to each of the four corners of the township. The plan is shown in the annexed diagram, as given in 1842, by Col. Charles WHITTLESEY (see page 521), in his sketch of Tallmadge. Here he passed his youthful days and from his sketch these facts are derived. to four adjacent places painted upon each. On each of these avenues there are now planted double rows of elms from the adjoining forests. The northwest diagonal intersects the town line about half a mile east of the corner, in order to avoid the Cuyahoga river, and the southwest diagonal has a deviation in a straight course in the village of Middlebury; otherwise all these roads, amounting to forty-five miles in length, are now travelled in right lines through the town as laid out by Mr. BACON. It was the intention of the contractor, Mr. BACON, to introduce a community of property to some extent, and among other things to have a large tract appropriated as a common pasture for all the sheep of the settlement, the proceeds to be drawn in proportion to the stock put in. No immigrants were to receive land who were not professors of the Congregational or Presbyterian Church, and two dollars for each 100 acres was to be paid for the support of the gospel. The latter provision was inserted in some of the early contracts and deeds, but, in fact, never went into effect. The first settlers prior to 1812 were: In 1808, Dr. A. C. WRIGHT, Joseph HART, Adam NORTON, Charles CHITTENDEN, Jonathan SPRAGUE, Nathaniel CHAPMAN, Titus, his father, Titus and Porter, and others of his sons, William NIEL, Joseph BRADFORD, Ephraim CLARK, Jr., George KILBOURNE, Capt. John WRIGHT, Alpha WRIGHT, Eli HILL. In 1809, Jotham BLAKELEY, Jotham BLAKELEE, Conrad BOOSINGER, Edmund STRONG, John WRIGHT, Jr., Stephen UPSON, Theron BRADLEY, Peter NORTON.